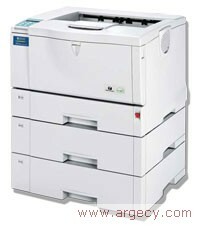 The compact 35 page-per-minute AP610N MICR printer offers everything needed to achieve the highest levels of MICR printing productivity and efficiency: low cost-per-page, fast throughput, a large expandable paper supply, flexible paper handling, superb image quality and intuitive device management utilities. Affordable and network-ready, the AP610N MICR serves as a robust MICR printing resource. The AP610N MICR offers Rosetta Technologies Intelligent MICR features like a programmable online dashboard, highly configurable alerts, as well as remote user and administrative control. And, with the ability to emulate PCL and PostScript print streams, the AP610N MICR printer surpasses all other printers in its class. E-13B FONT.� This font was created specifically for the AP610N MICR printer. The printer specific font ensures the highest achievable readability of MICR characters. ORIGINAL-MANUFACTURED MICR TONER CARTRIDGE. Toner formulation and cartridge design specific to the AP610N MICR printer engine, ensures high print quality, excellent toner yield, and long fuser life. MICR QUALITY GUARANTEE. Rosetta Technologies ensures the readability performance of the AP610N MICR printer when used in conjunction with approved MICR toner and check stock. PASSWORD PROTECTION: The AP610N MICR offers up to 10 user IDs and passwords that prevents unauthorized users from printing to the printer. The AP610N MICR printer's standard 500-sheet input capacity is enhanced by the added flexibility of a standard 100-sheet bypass tray for plain paper or special check stock. Boost the total paper capacity to a maximum of 1,600 sheets by adding up to (2) 500-sheet paper feed trays. Print onto plain paper up to 11 x 17, or a wide range of other mediums, including transparencies, card stock, recycled paper and custom-sized paper. Print up to 10 envelopes with ease, through the standard bypass tray, or up to 60 via the optional Envelope Cassette. Cut paper usage and filing space in half with the optional Automatic Duplex Unit for >printing IRDs, and without altering the footprint.